Yes, Olive oil is Paleo! Apart from the popular coconut oil, olive oil is also one of the staple foods in the Paleo diet. 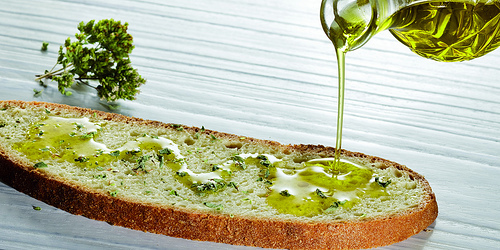 Olive oil is an edible oil made from mechanical pressing olives until the oil comes out. No chemical processing is allowed to produce olive oil. It has been used by humans for thousands of years and the proof has been found in archaeological sites in Israel and has been popular in the Mediterranean diet for its health benefits. Olive oil is mostly made up of monounsaturated fats (at 73%) which can lower the cholesterol level in the body and a little part of saturated and polyunsaturated fats. It is less processed compared to other healthy oils around thus, the higher healthy fats and phenols or antioxidants it contain. Olive oil is fairly resistant to heat that it can be used in cooking but in low heat as it is prone to oxidizing. It is best when unheated so it is ideal as salad dressings, condiments and marinades. Extra Virgin Olive Oil – Extra virgin olive oil is produced by mechanical extraction without the addition of chemicals, water or heat. It comes only from cold pressing the olives. It has the highest quality among other olive oils and is the most expensive type of olive oil around but has the highest polyphenol content. It has a perfect balance in terms of aroma, taste, color and acidity level at below 1%. Virgin Olive Oil – Virgin Olive oil comes from pressing olives and produced without refining, almost the same as the extra virgin olive oil. Its taste is lighter than olive oil and has an acidity level of 2%. Pure or Light Olive Oil – It is another variant of olive oil that can be confusing. The pure in its name is a blend of either extra virgin and virgin olive oil or refined olive oils. It is used when the extracted olive oil is poor in quality (i.e. : bad odor, bland taste) and so the refining process can make the quality better. Heat is normally used in the extraction process resulting to lesser antioxidant contents. Refined Olive Oil – Refined olive oil is chemically processed to remove impurities. Refining involves the use of solvent and high heat to neutralize the taste of the oil (Therefore this is not Paleo!). Olive Pomace Oil – This is extracted from pomace or olive leftwovers from pressing. It is usually done with chemical solvents. The anti-inflammatory content of olive oil which is oleocanthal is associated in lowering the risk of inflammation that can lead to chronic diseases such as diabetes, heart diseases and arthritis. The oleic acid in extra virgin olive oil can reduce inflammatory markers like C-reactive protein. Olive oil contains fat-soluble nutrients and antioxidants such as vitamins E and K and polyphenols. The phenolic compounds of olive oil, oleuprein in particular, can reduce oxidative stress in the body and can protect the polyunsatured fats and prevent them from oxidizing. The polyphenols in olive oil can help influence the composition of gut flora which is beneficial bacteria in the digestive tracts that can protect from autoimmune diseases like multiple sclerosis, Crohn’s disease, lupus and even allergies. Olive oil has anti-cancer properties. Many studies showed that the compounds in olive oil can help prevent cancer. There are several producers of olive oil around the world. Look for olive oils that indicate the harvest date Do not rely too much on the color of the oil. You can smell and taste the oil and it should smell and taste like olives. Choose extra virgin olive oil if you are following the Paleo diet as it came from mechanically pressing fresh olives and do not have chemicals added in it plus you can enjoy the full benefits of the oil. With storing your olive oil, keep it in a cool, dark place. Unopened olive oil can last up to two years. Store olive oil in a dark or opaque container. Keep the bottle of olive oil away from light or heat as it can easily oxidize and turn rancid. What Experts Say About Olive Oil.. Is It Paleo? Chris Kresser. Is it Safe to Cook with Olive Oil? Paleo Plan. Is Olive Oil Paleo?